ISLAMABAD, Aug 4 (APP): Chief of the Air Staff (CAS), Air Chief Marshal Suhail Aman on Thursday met his Kuwaiti counterpart and offered sale of indigenously developed JF-17 and Super Mushshak aircraft besides providing training to pilots and expertise to technicians. CAS is undertaking four-day official visit to Kuwait, a press release of PAF here stated. 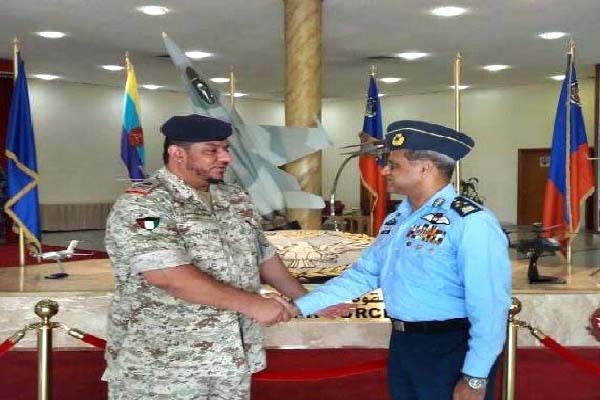 The Air Chief called on Major General Abdullah Yaqoob Al-Fodri, Commander of Kuwait Air Force and highlighted the success story of JF-17 programme. He offered the sale of indigenously produced JF-17 Thunder and Super Mushshak aircraft to Kuwait Air Force. He updated his counterpart about the flying training being undertaken by Kuwaiti Air Force pilots at PAF Academy Risalpur and offered assistance in establishment of training facilities for officers and technicians of Kuwait Air Force. Commander Kuwait Air Force appreciated high standards of professionalism being set by Pakistan Air Force and expressed his desire to learn from each other’s experience. He also reiterated further training of Kuwaiti pilots in Pakistan and thanked the Air Chief for offering quality training to Kuwaiti fighter pilots at PAF Academy. Earlier, the Air Chief called on Lieutenant General (Staff) Khalid Al-Jarrah-Al-Sabah, Defence Minister of Kuwait. He conveyed the best wishes and greetings from the government and people of Pakistan and thanked the Kuwait government for an unwavering support to Pakistan. He also discussed the bilateral relations between the two brotherly countries and offered assistance in establishing flying training and air defence setup for Kuwait Air Force. Defence Minister of Kuwait expressed his satisfaction on the level of brotherly relations and cooperation between the two countries. He lauded PAF’s role in fighting the war against terrorism and reiterated his resolve to stand by Pakistan in any hour of need. The Air Chief also met Lieutenant General (Staff) Mohammad Khalid Al-Khider, Chief of General Staff Kuwait Defence Forces, Major General Khalid A Saleh Al-Sabah, Commander of Kuwait Land Forces and Major General, Khalid Ahmed Abdullah, Commander of Kuwait Naval Forces.